Word is one of the most used computer programs on the planet. Helping you to compose text is one of the things that computers do well, but that doesn’t make the text-writing chore easier or imply that using Word is simple enough that professionals like you don’t need help every now and then. So enjoy this Cheat Sheet. Text and paragraphs in Word 2016 have special meanings. Specific terms are used in Word to describe these document elements as well as their formatting characteristics. Baseline: Text is written on the baseline. Cap height: Capital letters extend from the baseline to the cap height. X-height: Most lowercase letters rise to the x-height, which is named after the lowercase letter x and not anything mysterious. Ascender: Taller lowercase letters extend to the ascender height, such as the t shown in the figure. Descender: Lowercase letters that dip below the baseline drop to the descender. Proportional / monospaced: A proportionally spaced typeface uses different widths for each letter. A monospaced typeface features letters all the same width, as you’d find on a typewriter. Size: Typeface size is set in points, or units equal to 1/72 of an inch, as measured from the typeface’s descender to its cap height. Weight: The weight value is related to a character’s thickness. For example, bold text is a heavier weight than book or regular weight. Slant or slope: A typeface’s slope refers to how the text is angled. Italic type is an example of slope. Width: Some typefaces feature condensed or narrow variations. These fonts feature the same basic design, but the text looks thin or skinny. You can apply many formats to a paragraph in a document. The formats include the paragraph’s justification, first-line indent, left and right indents, line spacing, and space before and after the paragraph. Align Left: Text lines up the left side of the paragraph’s text. This is the default paragraph setting. Keyboard shortcut: Ctrl+L. Align Right: Text lines up the right side of the paragraph’s text, leaving the left side uneven. Keyboard shortcut: Ctrl+R. Center: Every line in the paragraph is centered, from left to right. Keyboard shortcut: Ctrl+E. Justify: Text lines up on both sides of the paragraph. Keyboard shortcut: Ctrl+J. Other paragraph formatting attributes are illustrated in the following figure. Left Indentation: This item measures the location of the paragraph’s left edge from the page’s left margin. It’s normally set to zero. Right Indentation: This item measures the location of the paragraph’s right edge from the page’s right margin. As with the left indentation, it’s normally set to zero. First Line Indentation: This format is applied to only the first line of text, which is adjusted relative to the paragraph’s left indentation. Space Before: This setting determines the distance between the current paragraph and the preceding paragraph. Normally, the Space Before value is set to zero. Space After: This setting determines the distance between the current paragraph and the next paragraph. Normally, it’s set to 8 points, which adds a wee bit of air between the paragraphs, similar to (and better than) pressing the Enter key to separate paragraphs. Line Spacing: This item sets the distance between lines in a paragraph. Traditional values are 1, 1½, and 2, which add distance equivalent to one, one-and-a-half, or two blank lines between each line in the paragraph. Use serif fonts for body text; use sans serif fonts for titles and headings. Avoid using right or center justification for anything other than document titles and headings. Full justification is ideal for text written in multiple columns on a page. If you use full justification, apply hyphens to long words: Press Ctrl+(hyphen) to insert a soft hyphen in the text. Split long words that wrap to the next line in a paragraph, rendering the right side of the paragraph uneven or causing Word to insert too much space to line up the text. A hanging indent is set when the first-line indent is less than the paragraph’s left indentation. If you indent the first line of a paragraph, don’t apply extra space after the paragraph. The first-line indent aids in readability, which makes the extra space redundant. If you don’t indent the first line of a paragraph, definitely set the Space After attribute to something other than zero. You add padding between the paragraphs to make the text readable. The Space Before attribute can help set document headings away from any preceding paragraph of text. Left and right indentations are set from the page margins, not from the edge of the paper. You can adjust the indents so that the paragraph extends into the page margins, though I recommend that you instead reset the page margins. In Line with Text: The default option treats the object as though it were just another character in a paragraph — albeit a potentially large character. Square: The object sits inside a rectangle, no matter what the object’s shape. Text flows around the rectangle, keeping equidistance from the object. Tight: This setting is similar to square, though the text is closer to the object and matches its shape. Through: If the object’s shape allows, text flows through the image, perhaps filling an interior space or space between separate sides of the same object. Top and Bottom: The object is held in a box with the top and bottom extending to the page margins. Behind Text: The object floats behind the text, as though it’s part of the page. In Front of Text: The object floats in front of the text, obscuring the text if the object is opaque. In all cases, the object can be attached to a paragraph of text or allowed to remain at a fixed position on the page. These settings appear in the figure, at the bottom of the Layout Options pop-up. Move with Text: The Anchor icon appears next to a paragraph in the text. The object stays with that paragraph on the same page. Drag the anchor to associate the object with a different paragraph. Fix Position on Page: The object can sit at any location on the page. Its position is unaffected by edits or additions to the text. These two options, Move with Text and Fix Position on Page, are available for only some of the layout options described on this web page. Date-and-time fields in Word 2016 are something you can easily code manually. Is doing so quicker than using commands on the Ribbon? You bet! Especially when you know the codes you want and can easily craft the field. Between the brackets, you can manually type any field, if you know the field name. For the date field, the name is DATE. For the time field, the name is TIME. Use the DATE field if you plan to mix date-and-time values. The field name is followed by one or more optional switches. The most common switch is \@, which is followed by a date/time picture string enclosed in double quotes. The characters you can use in the string are listed in the following table. The \* MERGEFORMAT text ensures that any formatting applied around the field is also applied to the field. If you’re assigning commands to keyboard shortcuts, creating your own macros, or simply wanting better access to your favorite commands, here’s some good news: You’ll find plenty of simple keyboard shortcuts available for the taking. Some are surprisingly simple combinations. Here are some references to different parts of Word 2016. You’ll also find some tips and suggestions on how to use many of these features. Print Layout: This is the standard view; in this mode, you see all elements on a page, including text, graphics, headers, footers, and even the page margins if you adjust the zoom. Web Layout: This view is good for creating web pages. It lacks page margins, just as a web page lacks various paper page elements. This mode isn’t good for writing documents that you plan to print. Read Mode: You use this mode to read text. Writing new text and editing isn’t possible. This is perhaps Word’s least popular mode, which makes you wonder why its shortcut is on the status bar. Draft: Word’s default view; Draft mode is good for writing text. When you need to format a page or add graphics, Word switches automatically to Print Layout view. Outline: Though this view presents a document’s text, it’s really designed for organizing thoughts or topics or anything with a hierarchical structure. To switch modes, you click on the Read Mode, Print Layout, or Web Layout icons on the status bar. Otherwise, click the View tab and choose a mode from the Views group. If you’re simply writing text, use Draft view. In this mode, Word presents text with character and paragraph formatting, but without graphical or page-level formats visible. Documents open in Print Layout view or Web Layout view, depending on which one you used last. The keyboard shortcut to enter Print Layout view is Ctrl+Alt+P. The keyboard shortcut to enter Draft view is Ctrl+Alt+N. The N stands for normal because this was once Word’s default (or normal) view. The keyboard shortcut to enter Outline view is Ctrl+Alt+O. Left: This is the standard tab stop, which left-aligns text that’s typed after the tab character. Right: This tab stop right-aligns text that’s typed after the tab character. Center: This tab stop centers text from left to right at the tab stop’s position. Decimal: This tab stop right-aligns text that’s typed after the tab character. Once a period (decimal) is typed, text continues left-aligned on the line. Bar: This tab stop inserts a vertical line in the text. It is purely for decorative purposes and doesn’t affect the tab character’s width or text alignment. Choose the tab-stop type from the Ruler: Click the gizmo on the far left end of the Ruler until the tab stop you want appears, and then click on the Ruler to set the tab stop. Tab stops are also set from within the Tabs dialog box. The Right, Center, and Decimal tab stops are best used in paragraphs that feature only a single line of text. Decimal tabs are ideal for aligning numeric values in a list or table. Word sets default tab stops on every line of text. These stops are positioned at half-inch intervals, unless another tab stop is set on the line. Document headers and footers feature default tab stops: a center tab stop in the middle of the paragraph and a right tab stop at the paragraph’s right indent. Avoid typing two tabs in a row. Instead, reset the tab stops so that only one tab character is needed. Remember that it’s the tab-stop type that affects the behavior of text that’s typed after you press the Tab key. 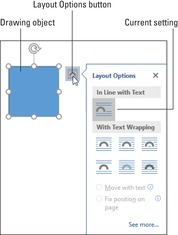 Section breaks help you include multiple page formats within a single document. The section break can affect page margins, page orientation, paper size, columns, page numbers, and the contents of headers and footers. The section-break commands are found on the Layout tab, in the Page Setup group. Click the Breaks button to view the section-break types. Next Page: Similar to a hard page break, this section break starts the new section at the top of a page. Continuous: This section break works like a next-page section break for the paper size and orientation formatting commands. For page margins and columns, the Continuous section break allows you to change formats anywhere on a page. Even Page: This section break works just like a next-page section break, but the new page starts on an even-numbered page. Odd Page: This section break is identical to the even-page break, but the new page always starts on an odd-numbered page. To best set a section break, position the insertion pointer at the start of a paragraph and then apply the section break. That paragraph becomes the start of the new section. Section-break effects are shown in Print Layout mode. To view the section break itself, use the Show/Hide command: Click the Home tab and, in the Paragraph group, click the Show/Hide button. To remove a section break, use the Show/Hide command to display its hidden code in the document. Place the insertion pointer just before the section break and press the Delete key. If you use the Even Page or Odd Page section breaks, Word may insert an extra blank page into the document to ensure that the section break starts on an even or odd page. Word determines whether a page is even or odd based on the page’s number. If you change page numbering in a document, Word uses the new numbering value and not the page’s physical page number.